Interest Expense is one of the primary components of Income Statement, where it is treated as an ‘Expense’ and is directly related to the Current Debt Position of the Business. 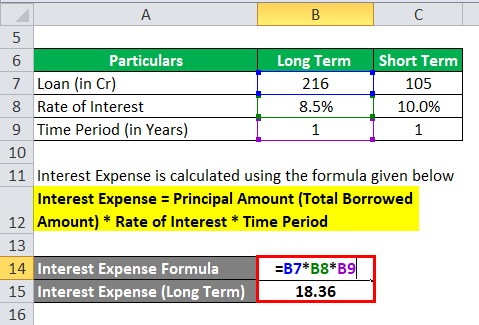 Let’s take an example to understand the calculation of Interest Expense formula in a better manner. ABC Ltd. took a Loan of INR 1,00,000 on 1st January with a simple interest rate of 8.5% per annum. On 31st December ABC Ltd. has paid the Principle loan Amount along with the Interest expense. Gati Ltd. has long term Loan of INR 216 Cr on 31st March with a simple interest rate of 8.5% per annum and a Short-term loan of INR 105 Cr during that time period with a rate of interest of 10% per annum. Both were taken a year ago. Calculate the Interest expense on 31st March. Total amount paid for Interest = INR (18.36+ 10.5) = INR 28.86 Cr. Tata Motors Ltd had total Borrowings (including Long-term and Short-term borrowings) of INR 88,950 Cr on 31st March 2018. On 1st October the Company has increased its total Borrowings to INR 92,923 Cr. Calculate the total amount of Interest the Company has to pay at the end of March 31st 2019 if the rate of interest stands @ 5.25% / annum. Loan taken by Tata Motors Ltd. on one year ago = INR 88,950 Cr. Total amount paid for Interest = INR (4,669.88 + 104.29) Cr =INR 4,774.17 cr. 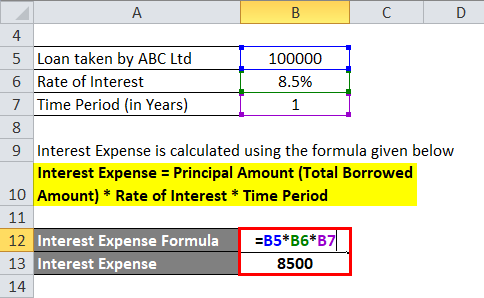 Interest expense is the cost at which the Lender gives money to the required party. Business houses need capital to do business. Capital can be of two types – one is Equity and another is Debt. Equity holders are the real owners who are entitled to take risk of the business and their return is not Fixed. On the other hand, the Debenture holders are willing to invest in the business but with an assurance of guaranteed return. Debenture holders’ charges fixed rate of interest and the Business is liable to pay irrespective of loss or profit of the Business. The same phenomenon happens with the Financial Institutions or the banks when they lend money to the business. Interest Expense formula is extensively used by the Companies, Firms, Government, Banks and Financial institutions as it is revenue of lender and an expense for the Borrower. Details of Interest calculations is always required as it might affect their Business negatively or positively depending upon the rate of interest and tenure of the loan. Due to higher Borrowings, some companies might find hard to see profitability due to higher expenses and there is the sinking of margins with profitability. Thus, the management might talk for a revised rate of interest so as to save their ‘bottom-line’. Again, during swift payment of interest, the borrowers might give a certain rebate in interest rate which actually helps borrowers to pay interest before the time. The rate of interests also depends on the Central banks interest rate changes. During high inflation, the government hikes interest costs for the banks so that the excess liquidity would get arrested and would result in lower inflation and vice versa. 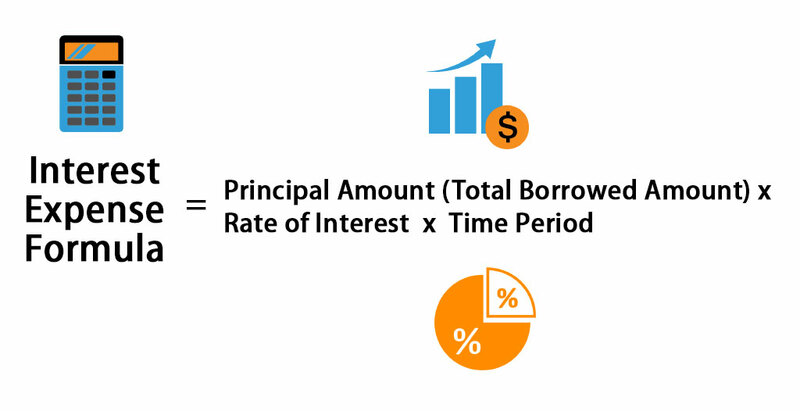 Thus, Interest costs have played a vital role for both the Lender and the borrower. For borrower’s point of view, higher the interest costs lower the profit as it tends to lower the Company’s Net profit margin. Higher interest costs are always healthy for Lenders as it tends to generate income from the existing Funds landed. You can use the following Interest Expense Calculator. How to Calculate Price Elasticity?